The American Institute of Architects has announced the top small projects in the US as part of its 2018 awards programme, including a wooden playground in Massachusetts and a micro home that aims to address the housing crisis. Now in its 15th year, the annual AIA Small Project Awards recognises the best buildings completed at a small scale or on a tight budget. The awards are divided into three categories: the first for designs that cost up to $150,000 (£111,000) to construct; the second for small projects with a $1.5 million (£1.1 million) maximum construction cost; and the third for buildings or installations under 5,000 square feet (465 square metres). Eleven winners were selected by a panel of industry professionals under this year's theme, Renewal, which was intentionally open-ended to encourage wide interpretation. 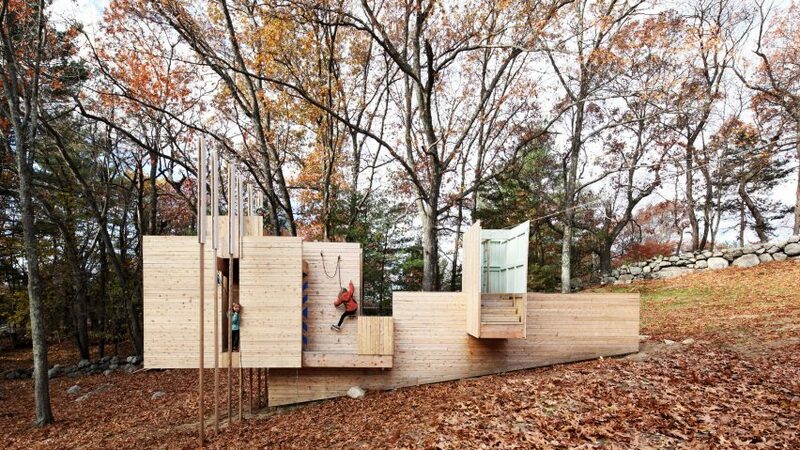 A play structure and a cabin workspace were awarded Category One prizes. For Category Two, awards went to a series of houses, as well as an outdoor installation in Arizona. For Category Three, the prizes were more varied and were bestowed upon a white house-like exhibit, a beachfront volume, a synagogue, and a facility building along a river. Five Fields Play Structure has no purpose and that is how it is intended to be. It is a landscape for exploration, shunning standard, in favour of liberation. It encourages inventiveness through its unfolding, discoverable spaces. Tailored to child size, but accessible to adults, it invites the older user to reminisce, and rediscover. The act of play is indeterminate liberation and irresolution. So how does one design for childish experimentation? The structure is created with the hope to release users from specified, directive use. The expectation is that all users will inscribe their individual, creative means of expression through the space. Sonoma weeHouse – a small, ultra-minimal, prefabricated home based on Alchemy's original weeHouse – was customised in collaboration with the client, Apple's Real Estate and Development Senior Design Director, and an architect himself. 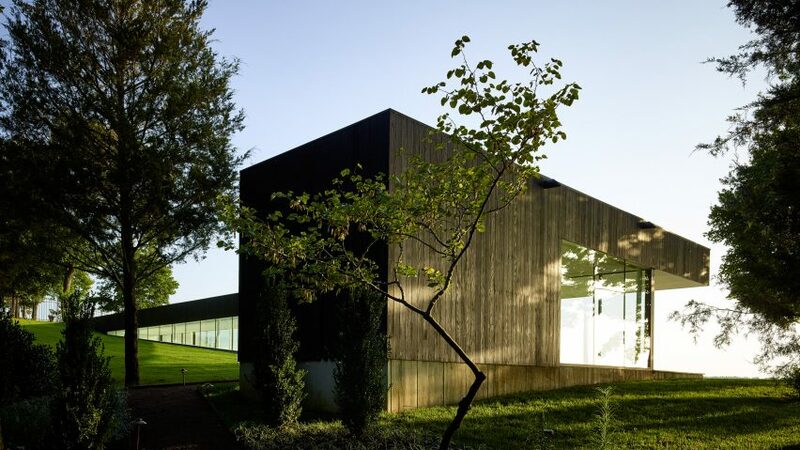 It is composed of two open-sided boxes set on concrete plinths nestled on the edge of gnarled oaks. The primary structure (640 square feet) features a whitewashed oak bed-box separating the living and bath areas. For shipping, this structure was designed as two modules: the main box, and a bolt-on porch, which cantilevers 10 feet into the dramatic landscape. 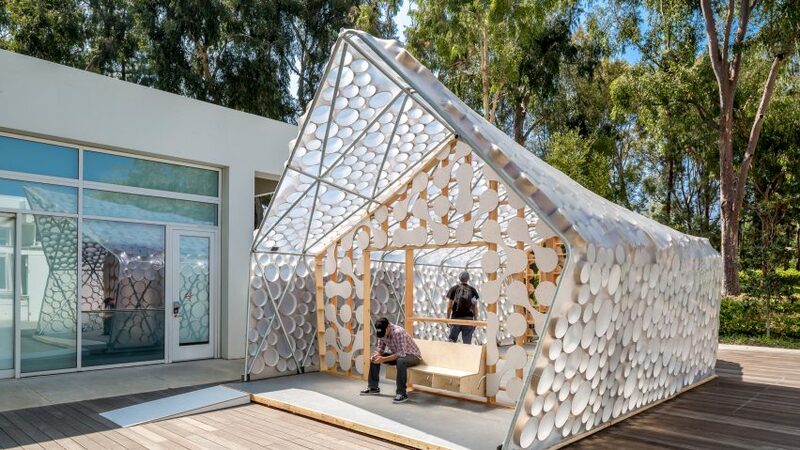 BI(h)OME is an experimental prototype lightweight accessory dwelling unit. Based on research and policy initiatives of UCLA's City LAB, the design was led by Kevin Daly Architects with design collaboration and fabrication by UCLA Architecture graduate students. The prototype demonstrates -- in its design, fabrication, occupation, and recycling -- what sustainability means at an individual level. Low-cost, low-impact it can serve as housing for an elderly parent, a returning college graduate, or a rental unit in any of the 500,000 single family parcels in Los Angeles. Each 500-square-foot BI(h)OME contains a bedroom, living room, kitchen/dining room, and bathroom. Its structure is covered with an innovative translucent skin consisting of two layers of ETFE that is vacuum-sealed around a paper honeycomb creating a remarkably solid, yet light structure. The structure can be configured in different ways to fit any backyard and to catch the sun on photovoltaic cells that can be printed on the outside layer of the skin, while LED lights can be built into the inner layer. The Grand Lake Poolhouse comprises a pair of lakeside pavilions containing a pool and spa in North-eastern Oklahoma, overlooking Grand Lake o' the Cherokees. An existing clearing in the tree-lined hill is cut into with a single-story volume running parallel to the lake. A smaller volume is placed perpendicular to it, set slightly apart from its companion volume to capture a patio at the meeting point of the two axes. An L-shaped roof plane connects all internal and external space, creating a consistent datum that references the lake's horizontality. To preserve views across the site and enhance swimmers' views from within, the longer glazed pavilion is embedded in the undulating landscape, while the smaller pavilion – containing massage and washrooms – offers a counterpart to its more visually open neighbour with its intimate proportions and protective charred timber cladding. Together, the two volumes read as a distinct but unified pair; a discreet addition to the broader landscape. By transforming a traffic median into a public space, Shadow Play fosters pedestrian life and improves the downtown Phoenix streetscape at Roosevelt Row. 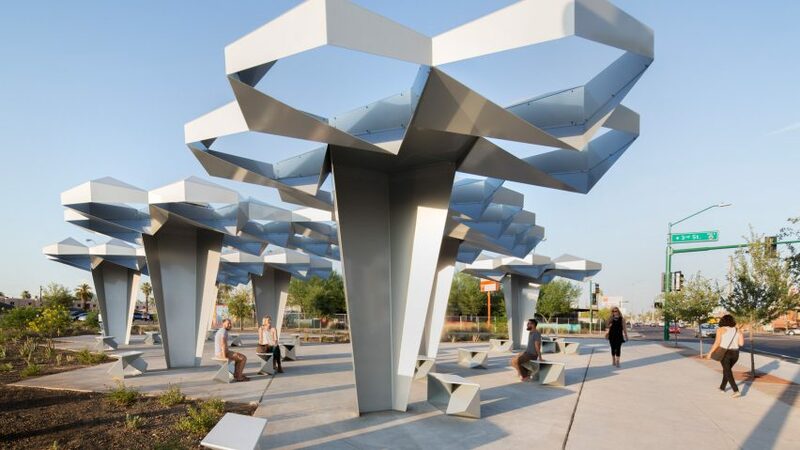 Clusters of shade structures create a respite from the desert sun by offering a public parasol at an urban scale. Shadow Play's hovering canopy is formed from an aggregation of identical geometric modules. Each module is fabricated from a steel plate to create a thin but structurally rigid cell. The aggregation of individual cells form clusters that span between vertical supports to create an angular canopy of open cells. The folded steel cells filter the intense sunlight, casting shadows on the ground and creating local micro-climate in the shade. The geometry of the canopy maximizes the production of shade and shadow while allowing for breezes and air movement. 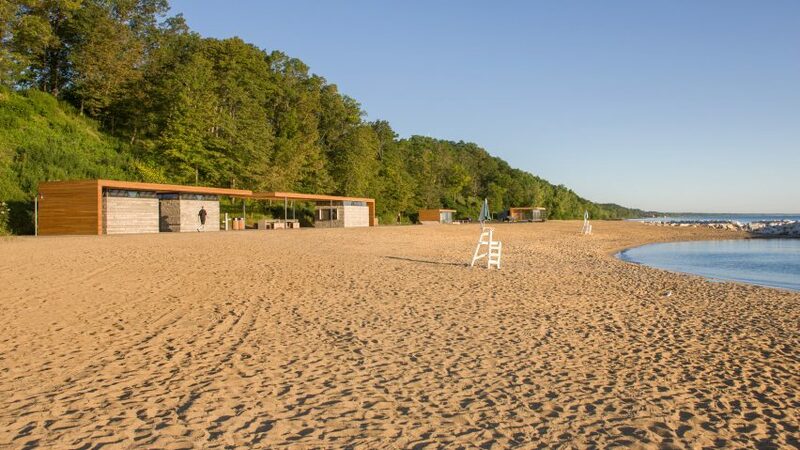 Our solution to reactivating Rosewood Beach rooted basic amenities and an education pavilion in an elemental lakeside experience – a leisurely boardwalk stroll that meanders 1,500 feet, connecting access points at each end and giving visitors an ever-changing journey along Lake Michigan. To minimize bulk, only functions needing privacy or separation are enclosed. All else is outdoors on the boardwalk itself, which wraps up and over to form simple, low-profile pavilions and site furnishings. Pavilions are long, low, thin, and topped with boardwalk planking so that views down the beach and from the park above are preserved. At the north end, the boardwalk expands to become the education pavilion. Moving south, the boardwalk morphs into benches and bridges a stream to reach the lifeguards' station. Beyond, it folds up to form the snack bar and restroom pavilions. Materials are natural, simple, "beachy":  ipe, cedar, polished concrete, rough field stone. 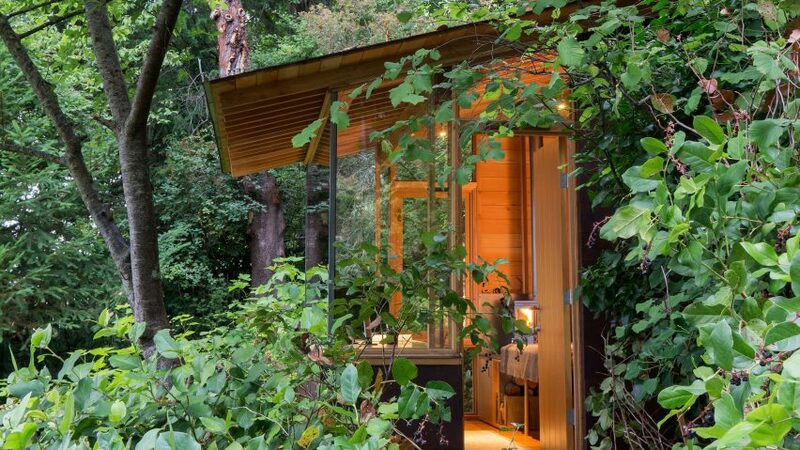 Conceived as a multi-use building, this 80-square-foot studio/bunkhouse was designed to fit carefully into its natural context, located just 30 feet from the main house. The building was framed by an 11-year-old and her dad with rough-sawn Douglas Fir from a nearby sawmill. The framing lumber and shiplap sheathing were exposed in order to display the nature of the structure. Rigid insulation was applied, then finished with 22-gauge Corten steel "shingles" hand-cut from sheets of the material. Designed to have a folding desk and beds, the building can function as a bunkhouse for the 11-year old, a design studio for her dad, and, when everything is folded, a poker room for her dad's friends. 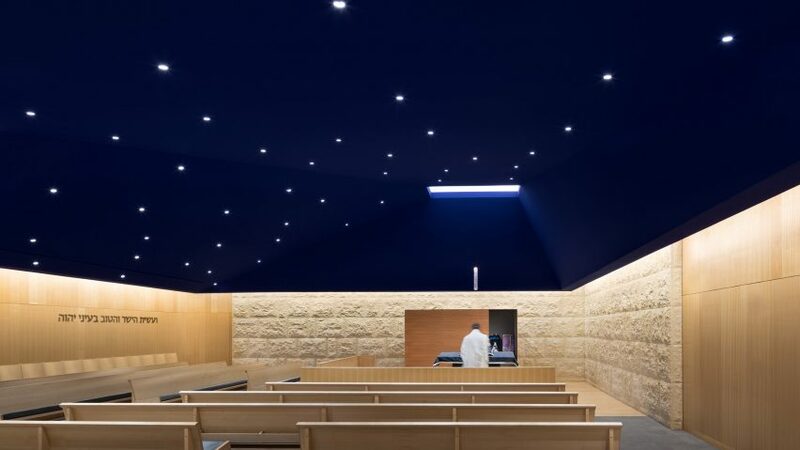 A Lower School's gymnasium was transformed into a Chapel, creating a modern composition of space and objects that re-imagines the traditional synagogue at an intimate scale for quiet meditation, connection, and prayer. The Chapel is inspired by ancient texts that describe the Holy Ark as a simple, acacia wood box in the Wilderness of Sinai. The deep blue ceiling's pyramidal form creates an asymmetrical soffit that can be read as both "roof" and "celestial sky," and features a luminous opening from which a Ner Tamid light is suspended. Vertical maple strip panels on the walls reinforce the metaphor of the forested wilderness, while the Jerusalem Stone wall fragment behind the Ark is a symbol of the Wailing Wall and a reminder of the project's below-grade location. Beautiful materials and exquisite craftsmanship combine in a modern composition of space and objects that re-imagines the traditional synagogue at an intimate scale. The Rear Window House is a discreet yet decidedly modern remodel and addition to a seventy-year-old bungalow in a neighbourhood with numerous intact dwellings of the same era. The owner's growing family necessitated building a 450 square foot extension into the backyard, consisting of a new master suite and library. To strengthen the connection between old and new, the addition maintains the 3:12 roof slope prevailing in the existing house and throughout the neighbourhood. The new volume is entirely skinned with asphalt roofing shingles, which anchors the building to the vernacular materiality of the area, while projecting a uniquely contemporary identity. The project culminates in the master bedroom's expansive rear window, formed of aluminium-clad plate steel, which cantilevers above a quietly bubbling pool of water. The window offers the intensely private experience of sleeping and awakening in nature, and at times the house feels a thousand miles from the city. A pump station is usually a perfunctory piece of urban infrastructure used during flood events. In this instance, however, the architect was asked to create a pump station that was sympathetic with the Principal Riverwalk – a $50 million development along the Des Moines River. The resulting design created two objects – a Pump House and a Gate Valve Platform - that work with a neighbouring Café Pavilion to frame an understandable place. The Pump House is a formal foil to this Café –sharing a formal language and material palette of black zinc and steel. The Gate Valve platform became a glowing, translucent object atop a cast in place concrete base. Together, the Pump House and Gate Valve Platform flank a recreation trail marking the entry to street level. 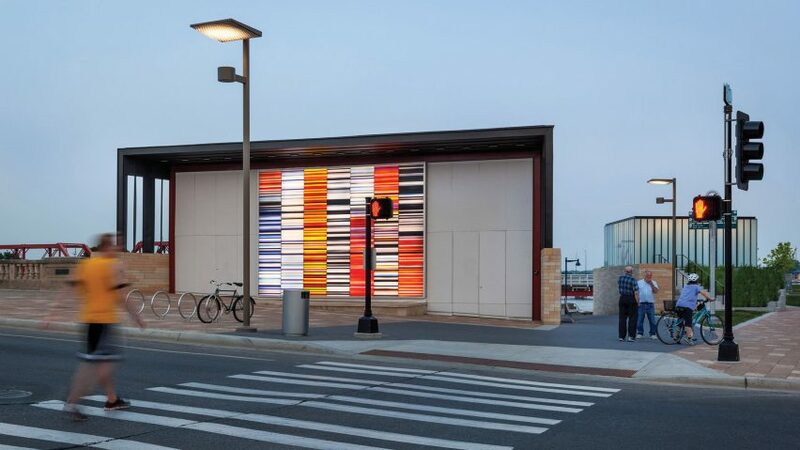 The architect worked with artist, Jun Kaneko, to integrate a glass mural, Expansion, mounted to the north face of the Pump House. 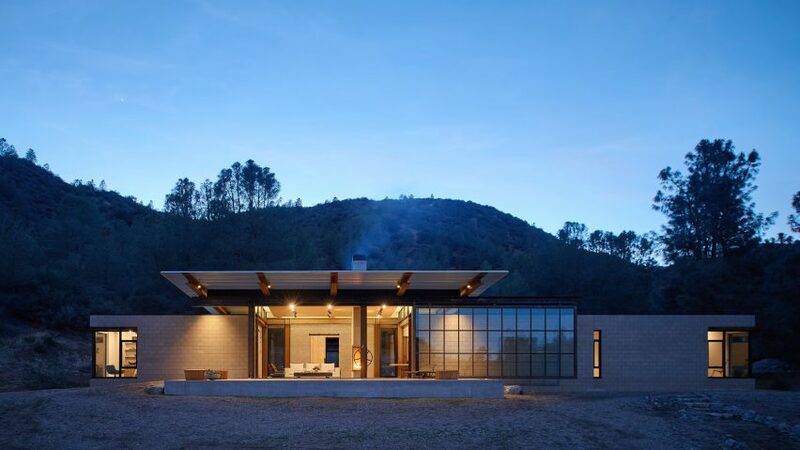 Set in the harsh high desert of California, Sawmill is a family retreat embedded into the tough, scrubby landscape. The design approach was driven by a scavenger mentality—at every turn, Sawmill harnesses the extreme opportunities presented by its remote site—seeking always to do more with less. The net-zero home operates completely off the grid, reducing environmental impact and operating costs. Salvaged and recycled materials were used whenever possible, including structural steel recovered from a nearby cement mine and wood discovered onsite in an existing barn. The benefit of such choices is manifold: not only were these materials diverted from the waste stream, they provided significant cost savings while reducing the home's carbon impact. Ultimately, Sawmill's low-maintenance and durable materials were selected for their ability to withstand the rugged environment that the family seeks to engage with, making this home tough as nails and long-lasting for future generations.